Iron ore was unchanged at $104.20 a tonne on Monday amid a weeklong Chinese holiday having clawed back more than 20% of its value since hitting a three-and-a-half year low of $86.70 on September 5. This time last year the commodity was trading above $170 a tonne and the price plunge in August – similar to a drop in October 2011 when the price of the commodity gave up $60 – is unnerving the many mining juniors advancing projects in the Labrador trough in north-eastern Canada. 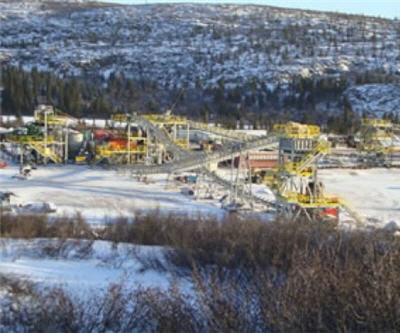 A month ago Labrador Iron Mines (TSX:LIM) took the lead and cut back on capex and most agree a prolonged drop in prices could lead to much slower development in the region. Iron mining in the Trough dates back to the 1950s and the region currently produces around 40 million tonnes a year. If current projects come on stream output could increase to 120 million tonnes – the global iron ore seaborne trade is north of 1 billion tonnes. The other benefit of partnering with Asian steelmakers is that the Canadians get unique market insights. They all say that the Chinese firms believe the market volatility is temporary, and that pricing should return to US$120 or US$130 a tonne in the coming months as China begins an aggressive economic-stimulus program. When China implemented a stimulus in 2009, it drove the iron-ore price from roughly US$60 to US$180 in a matter of months. A major reason price should rise from current levels is that several domestic Chinese producers cannot mine iron ore profitably at $100 – $120 a tonne – several have already suspended operations. The quality of ore at the country's mines is just too low – iron content is pegged at an average 20% and is set decline further. That compares to Australian, Canadian and Brazilian ore's 60% average.